Almost 2 weeks ago, Ollie has started fussing and chasing the girls away from the f/v portion of their diet. I've still seen him eat with Skadoosh on occasions but then he'll chase them at times. It seems mostly in the early morning hours but sometimes it happens during the night and at first I thought it was because I slightly reduced f/v due to the girls being quite chunky. I've increased the amount, even more so than instructed measurements, I separated the f/v bowls, now across the cage from each other instead of next to each other. 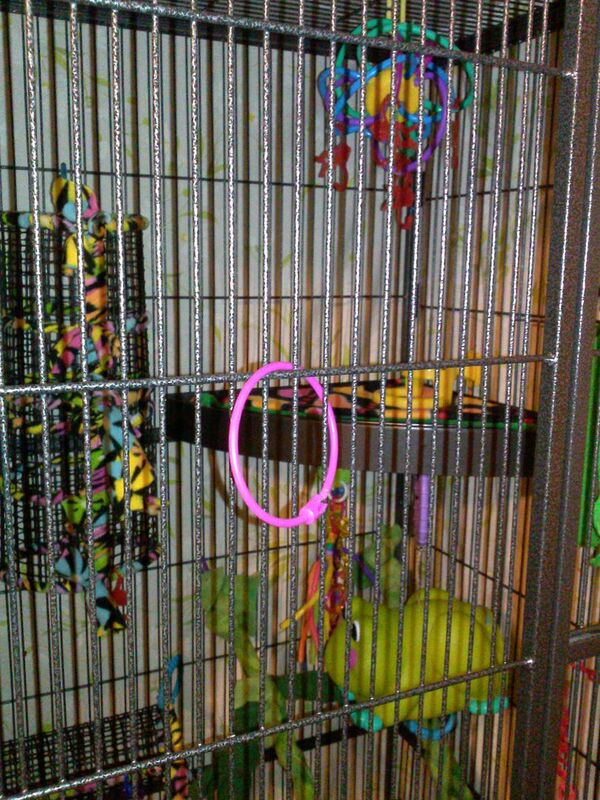 I have also added snacks in the cage again, which I'd gotten away from (I was offering them during cage visits due to I was trying to spend as much time with them as possible. I try to get food in prior to them getting up, but Ollie is an early riser and if I get home a little later than usual he will be up waiting for his food. He always eats first, as soon as f/v is placed inside, if he isn't up, he gets up. He has never minded the light on in the room, the girls wait usually until it's darker, or light is out, except sometimes Skadoosh, when I'm running later will sometimes come out now when the light is still on, but this is rare. He doesn't seem to have as much problem at that time. I'm really thinking it becomes a problem when the bowls become almost empty to empty. I don't have a scale, but Ollie, who was a little guy could have put on a little weight, the girls still look chunky as ever. They are eating machines! 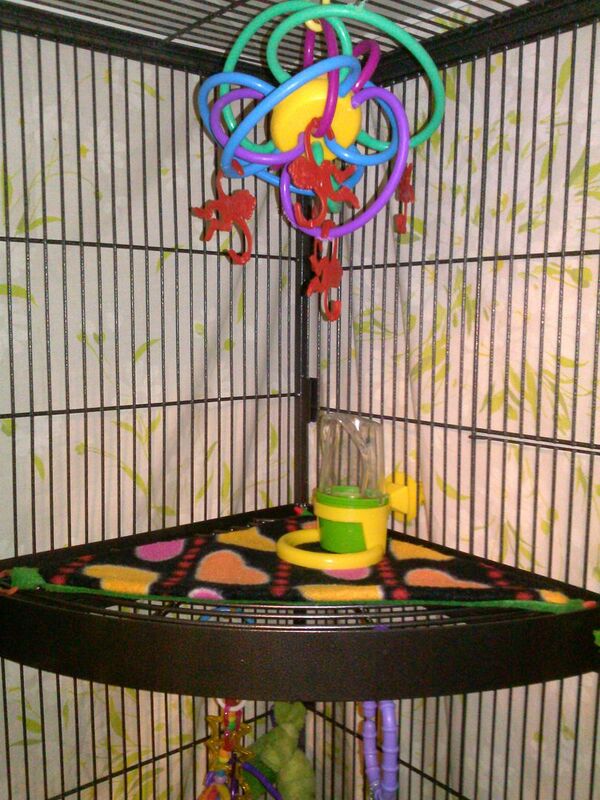 I'm not sure how to handle this now, I do not have room for another set up for Ollie, and not sure I want him alone. They all got along so well, I'd see them all eat side by side, and hardly a scuffle with a few fusses in the pouch, but the normal. But Ollie makes these threatening noises, a chatter that doesn't sound nice and then leaps and crabs at my girls now at times, over food. What could have happened to change their dynamic? What else can I try to keep them together? Do you offer any pellets in the cage? I put a small dish of pellets in the cage to tide my early eaters over, specially if I think I am going to be late with their dinner. 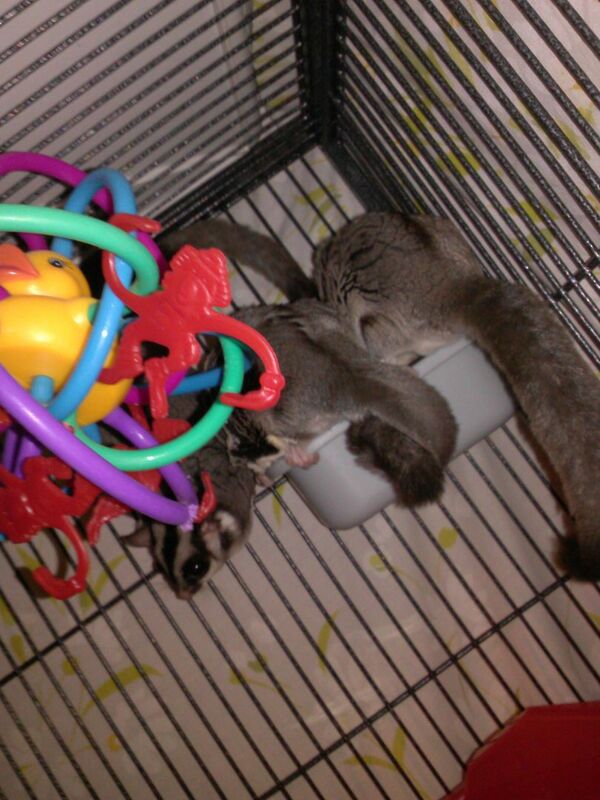 I use Happy Glider breeders formula. Multiple feeding stations, which it sounds like you are already doing. I would not cut down their food even if the girls look chunky, unless they have fat deposits in the patagium I wouldn't worry about the weight they are carrying. Although a full bounce custom cruiser would make those fluffy girls work harder. Thanks, I also use the Happy Glider pellets, my girls used to eat them, but not as much, can't tell how much Ollie is eating. I usually use pellets mixed with a few dried cranberry or pomegranate and a few pine nuts in their forage toys. I've been trying to keep some in there regularly, but Ollie just seems to patrol the floor where the cups of f/v are. I'm looking into alternatives for f/v higher up in cage as well now, but I always liked keeping them on floor level and it was never a problem, I don't know why he's started being such a bully to my girls. Can you place the food at different levels so they are not in line of sight of each other or hide it behind a hammock or something. I would have the exact same food in each dish and more dishes (one for ech glider plus one more). Or use an igloo so they can't see when another is eating. This may sound like a waste of food but if it's food aggression, this worked for me. Mine started his food aggression after 2 years with no other changes. Thanks, I ordered a corner shelf this morning and plan on picking up another food cup after payday (which is next Tuesday). In the meantime I may be able to find some way to block view between feeding stations. Thanks yiyo, I actually already have a couple of barns that are similar to the igloos that I formally used as diners and they were good, but then I switched to a more open environment feeding system to eliminate diners (although the barns were not too bad, I just detest diners). I have been using bird-style feeders, cups used for f/v and silos for liquid portions as well as water. These feeders attach to the cage walls and are easily removed dishes for cleaning and refilling. I'm also a bit nervous to use the barns/diners now that aggression has set in, as there is only one opening for in and out and I'm afraid that leaves no where for the victim to run. I purchased another feeder cup today and the corner shelf should be here soon as it was shipped yesterday. I will update further developments. Ok, so the corner shelf came today I'm glad I had stopped Friday and picked up extra feeding cup! I got it in, it was soooo big, I couldn't put it where I originally wanted to, but it's ok where it is I think. So now there are three f/v feeding stations, I'll put a serving per glider plus a little extra in each. I hope this works having the one on top. I'm hoping that Ollie will use that one instead of going to the floor and then let the girls go down to the floor. The girls need more exercise, lol. It's still really weird to me, I sometimes see them all three eating, sometimes just two of them, and do ok, then after a while the bullying starts. I'm not sure if it's when the food gets lower, or if there is a special f/v that Ollie wants to hog for himself. I really haven't seen it go down from beginning to end, so I can't say. Here is the photo of corner shelf and third (elevated) feeding station. Ok, well I still heard a skirmish or two last eve, but not so much fussing this morning. I decided to go back to a different type bird-style feeder that I used prior to the enclosed cups, they're actually kennel cups but work the same. 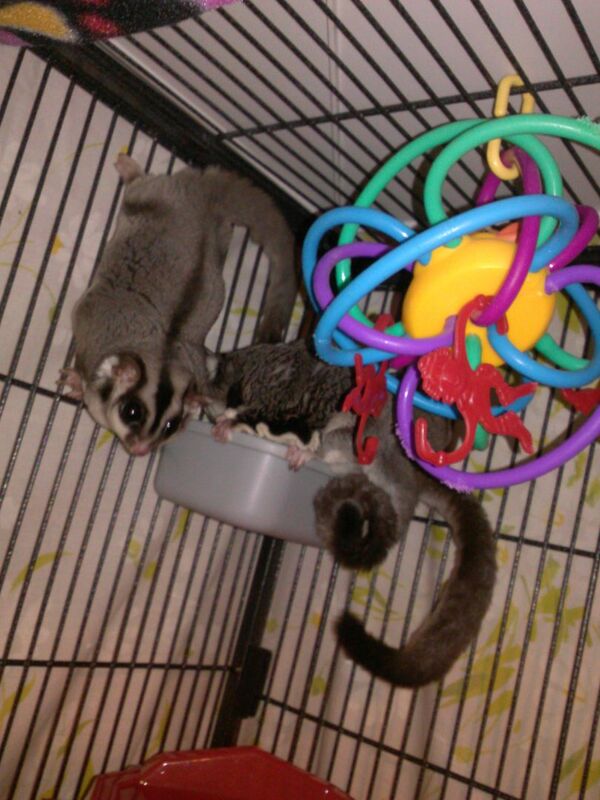 I will have to hang them higher in the cage to try avoiding soiling of food. I'm just going to try different things until something works that I can deal with. Well now, trying out the open cage mount feeder, that allows more room for them to access food, I'm thinking Ollie must have gotten tired of the restriction of the smaller, covered feeder cups (I liked them because I felt it kept food cleaner). 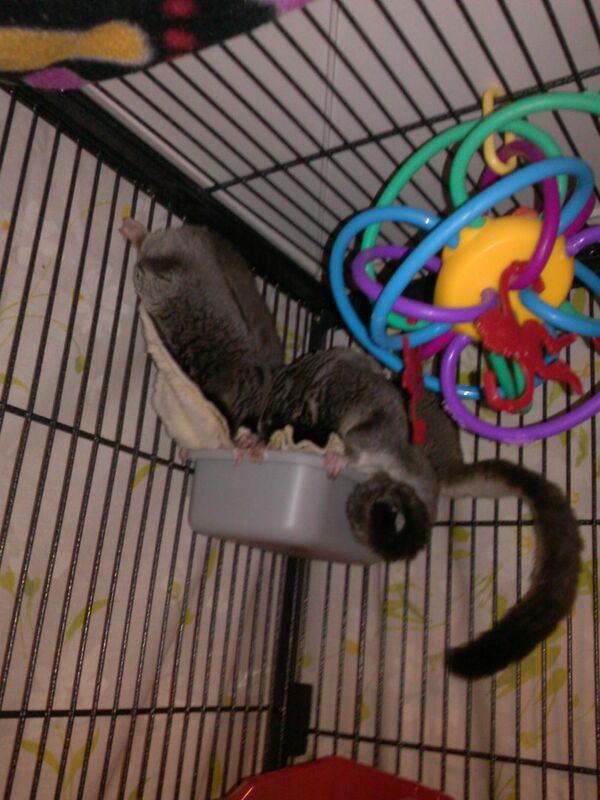 It was funny, Ollie was already up and on floor of cage when I went to feed them. He waits by where I serve the food if it's not there when he gets up. He must of noticed the one cup holder I placed back in near the floor to use for pellets for snacks (which I'm out of). I had to lore him up with the empty cup to where the "real" feed cup was, lol, it was so cute because he's such a creature of habit. Here they all are, out eating, even with the bright light on. Skadoosh catches on that I was taking photos. I need to get some more pellets, I like the Happy Glider, but don't want to buy large portions. The last one I had went bad because I had it too long and I had to throw it away. Last edited by Terry; 07/13/14 09:30 PM. Yay! No arguments all last night or this morning over food as I could tell, and I was up a good bit, I'm pretty sure I would have heard it. Hopefully the new trend will continue. Looks like it worked - hope you don't hear any arguing for a bit. Thanks, I'm hoping so. It's a bit more messy this way though, but worth it if it works. I heard a little skirmish last night and again this morning. Sigh, I really don't want to resort back to diners, I'm working on a new plan.